ETX Capital is based out of London and has proven themselves as a good online broker for years now. The firm itself have been around since 1965 but have not been and online brokerage since, for obvious reasons. EXT is run and owned by Monecor limited and is a member of the London Stock Exchange. ETX Capital is regulated and authorized by FCA and are registered under the number 124721. The address of their headquarter is Broadgat, EC2M 2Qs, London in the United kingdo. In the business of trading your reputation is all you got. If people do not believe that you are an honest brokerage they will not buy you services. ETX Capital have been in Business on the good side of 50 years now, which gives them both experience and a heavy load of trustworthiness as a brokerage. ETX Capital is regulated by the Financial Conduct Authority (FCA) with the registration number 124721. And as a long time player in the game they know to take their reputation very serious and do implement various stern measures to secure the trust they have built over time. EXT Capital have also won several awards in a variety of categories of the online trading business. 3 different platforms are offered to clients at ETX, the choices are as follows; EXT Trader Pro, ETX MT4 and last ETX Binary. A great platform made for the seasoned trader. With the unique feature of being able to have multiple charts with a broad selection of cutting-edge charting tool shown at the same time, this platform rises above the bulk of other platforms available. This platform will make clients able to dig deep into the movements of the market and, if used right, produce great insights into the world CFD trading. This platform is the one which have reached the public with most success. Metatrader have been a popular trading platform for a long time, but are still able to compete with newly developed platforms. The same basic structure is used again and again in all of their updates, which mean that once learned, clients will not have to relearn a new interface every year or so. Metatrader4 offer a solid range of trading features along with a lot of educational material, to sharpen the skills of its users. This platform is also very secure and protects its user’s information brilliantly. The platform is EXT Capitals newest trading platform. As the name implies this platform is not used for CFD trading, but for trading binary options. 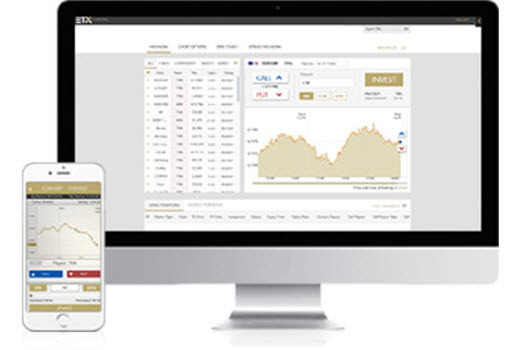 You can trade in all the usual binary assets like currencies, market indices, commodities and stocks. The platform itself is pretty much a mirroring of the EXT Trader Pro platform, so if you are used to that one, getting started here will be no problem at all. EXT Capital has 2 different account types, one demo and one real. The demo account is like any other demo account in that it gives the user the ability to trade in a real time, live action market environment with virtual money. It’s a great way of getting accustomed to their software before spending any money and making possible expensive mistakes. Their real trading account opens up for all features and can be created with a minimum deposit of €100. With a dizzying list of assets, counting over 6000 different types of financial assets you would have to be more than normally picking to speak bad about ETX Capitals portfolio. The clients will have a huge amount of assets in the markets of Forex, Commodities, CFDs, Indices, stocks and ETFs to choose from when getting down and dirty with trading. As for leverage the highest is on forex, reaching up to 1:200. The leverages for equities and indices have a range from 1:20 up to 1:100 and the commodities average out at about 1:100. ETX Capital offers great support, sadly not around the clock. The tubes are open between from 7:30 am to 9:00 pm from Monday to Friday. Their customer service is offered in multiple languages including; Arabic, Chinese, Czech, Dutch, French, German, Hungarian, Italian, Polish, Portuguese, Romanian, Russian, Spanish and Turkish. The support options are email and a toll free telephone, there is no live chat option. But the both of the services are available in the languages listed above. The minimum deposit on ETX Capital is a humble amount of €100, which gives you access to an account. ETX have made the process simple, easy and straight forward and makes it able through all of these ways; China UnionPay, Credit/Debit Cards, Giropay, Neteller, Skrill, Sofort, and Wire Transfer. When you want to make a withdrawal from ETX Capital it will go through the same pathways as deposits were made. EXT Capital will charge their clients no fees for withdrawals and they will make them be really quick. When doing withdrawals through wire transfers and bank wire transfers, it will take no more the 3 business day, but usually only 2. If using any other methods it will be between 3 to 5 days. Accepted; Thailand, United Kingdom, South Africa, Hong Kong, India, France, Germany, Norway, Sweden, Italy, Denmark, United Arab Emirates, Saudi Arabia, Kuwait, Luxembourg, Qatar and most other countries. Not accepted; Afghanistan, Algeria, American Samoa, Angola, Australia, Belarus, Belgium, Bosnia And Herzegovina, Burkina Faso, Burundi, Canada, Congo DR, Central African Republic, Chad, Cote D’Ivoire, Cuba, Eritrea, Guam, Guinea, Guinea-Bissau, Guyana, Haiti, Iran, Iraq, Lebanon, Liberia, Libya, Myanmar, Macao, Panama, Papua New Guinea, Puerto Rico, Singapore, Somalia, Sudan, Syria, Tunisia, United States, Uganda, Ukraine, Virgin Islands, U.S., Vanuatu, Yemen, Zimbabwe.